I assembled the first copies of the Argos resin master parts and took a few photos. Production molds should be made next week and the final pewter miniatures will be available later this month for purchase. 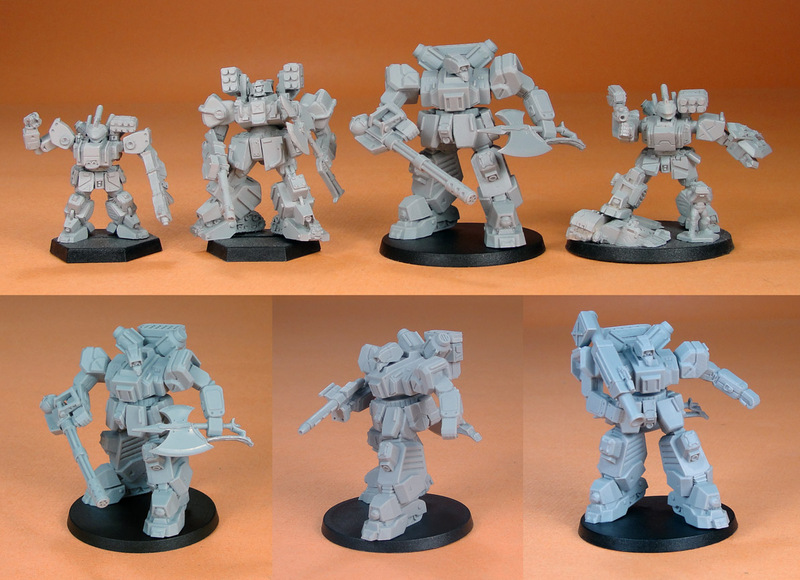 The photo shows the Chieftain (top left), Crusader IV, Argos, and Gen Con 2013 exclusive Chieftain IV (top right), minis shown for size comparison. The Argos is a bit bigger than the Crusader IV and is about the same size as it's counter parts in the North, the Kodiak and in the South, the King Cobra. Lower part of the photo shows the Standard Loadout (bottom left) with very heavy autocannon, heavy rocket pack, and vibro axe, the Demolisher variant (middle) with snub cannon and air burst missiles, and the Shamshir variant (right) with heavy bazooka and anti-gear missiles.